Wallpapers to hide X notch and Dock. Status text color ​refrects background. The color of the background can be from black to white, but since Dock is from gray to white, it uses the nature of iOS that it will not be able to make a difference as it gets brighter. 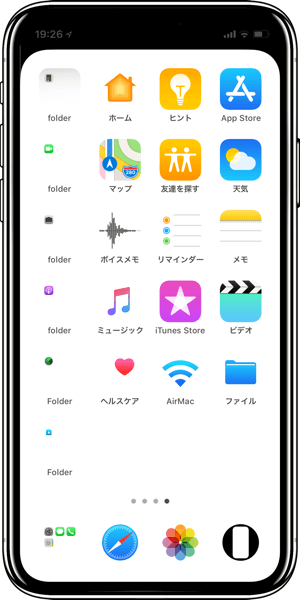 I made a lineup of the brightness which is difficult to distinguish from the Dock. If the background is too bright the Dock will be gray, but the black part to hide the notch will lower the average brightness. For "Reduce Transparency", the background is matched to the color of the fixed Dock color. On iPhone X, even if you try to display the wallpaper of the screen size perfectly with pinch-in or "Reduce Motion", the position is not fixed because the image stretches the vertical direction. On this site, I made wallpapers with unnecessary adjustment by finding the display position of the pixel size equalizer wallpaper size "Still". The size is 1301×2820 pixels. The display position in "Still" is presumed to be 59.5 pixels from the top and 86.5 pixels from the left. Because it is a special specification of 0.5 pixel unit which does not exist in substance, the distortion of the image of the curved portion may become uneven. To make it possible to express a smooth curve after setting, I adjusted the density of the boundary part by 1/100 of a pixel in production. I made the upper and lower margins even. These backgrounds are brighter and the letters turn black. The black letters on the iPhone are actually not black, even though they look black, but it gets darker, brighter and more colored depending on the background. It is not noticeable on a light background, but on the black background you can see the real color. If the background gets darker or there are multiple colors, the color of the letters will also become unclear, so I wanted you to enjoy this, and for the time being I have solid backgrounds.